- Improves program stability when mounting disc images with the Virtual Drive function. Now the tilt-shift effect in photos can be created with Tilt Shift Generator, which uses a special algorithm to blur specific areas of the image with the right force. Available at a small fraction of the price of a real tilt-shift lens, the new product offers a greater degree of creativity by providing many more tweaks, options and customization settings than even the highest-end tilt-shift lenses. Tilt-shift photography is a unique style of photo art that makes a life-size object or location look like a miniature model. To achieve this, the camera is equipped with a special tilt-shift lens, allowing photographers to go beyond the limitations of DOF and perspective. Ideally, photos need to be taken from a great height, for example, a bridge, mountain or helicopter, which creates the illusion that the viewer looks at a miniature model. PhotoDirector is a unique application that combines all the features you need for photography in a single workflow – efficient photo management, complete adjustment and creative editing. With native 64-bit support, PhotoDirector enhances your photos in a non-destructive process, and RAW support for popular DSLRs and 4K Ultra output, PhotoDirector is all you need to turn your photos into works of art. Bring out the colors in your shots with a wide range of tools for tonal adjustment, white balance & saturation control, including curves and levels. 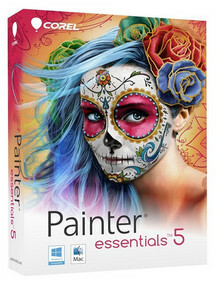 Comes with a number of selection brushes to isolate areas in a photo and edit with complete adjustment tools. Easily identify overexposed or underexposed areas in your photos. Values are arrayed across the graph from left (darkest) to right (brightest). Automatically correct distortion from popular lens makers. Deliver crisp, sharp images with detail sharpening adjustments. Adjust individual RGB channels to control color and contrast. Impart drama and style by adding different colors to both the highlights and shadows of an image. Use gradient masking techniques to get the miniature model look for your photos. Choose from a range of photo presets including HDR for quick, creative image adjustments. Download thousands of FREE presets created and shared by PhotoDirector users on the largest creative editing community website, DirectorZone. Explore your creativity with easy-to-use tools to transform your photos into works that capture the imagination. Unique People Beautifier Tools contour figures and take away the extra pounds that cameras put on. Unlike simple red-eye removal, Eye Blinger enhances whites of the eyes by removing color casts and bringing out the color of the eyes. To create smoother, youthful looking skin, use the wrinkle removal to retouch imperfections and blemishes in specific areas. Smooth out skin and even out tones to give your portrait a professional look with the Skin Smoother and Eraser tool. The Tooth Brush makes it easy to whiten teeth. Select the Eraser tool and you can fine-tune the areas where you applied the brush. Merges up to 5 bracketed shots into a single high dynamic range (HDR) photo with automatic alignment and ghost artifact removal. Remove unwanted objects or people from photos automatically by intelligently filling in the background area. Easily extract ojects from images and transfer them as overlays onto other photos. Includes intelligent tools to select objects or people to extract. Improve photos by removing distracting wires and power-lines using the versatile content-aware removal feature. Apply black and white, blur, sepia and tint effects. Use brush tools to mask areas you want to remain untouched. Design your watermark with titles, frames, and images. Add copyright, camera model, exposure, aperture, shutter speed and ISO information. Our photo collections grow quickly. PhotoDirector lets you manage, adjust, edit and export photos in one intuitive application. Organizing photos in your library is almost effortless with automatic face tagging. Automatically organize, apply quality adjustments and presets during import to save time. Add and edit the IPTC metadata of an image—including shutter speed, exposure information, capture date, ISO, etc. A handy way to create groups within larger folder-based photo sets—combine a group of images with a similar frame of reference. Within the Photo Library Module, choose between different viewing modes to compare images. View two photos side-by-side in Compare Two mode or multiple photos at the same time in Lightbox Mode. Choose between three different modes (single/compare/grid) to compare the original photo with edited images to decide if the adjustments you applied are the exact effect you were looking for. Edit your photos while viewing them in several layout options. Display a large portion of the image as well as a small filmstrip of thumbnail images simultaneously to conveniently and quickly apply adjustments to several photos. RAW files provide higher quality information and more flexibility in processing than other formats, but processing them can result in frustrating delays. PhotoDirector 5 solves the problem with new RAW processing technology that's faster than ever. Nearly 3x faster than the previous version, and up to 40x faster than leading competitor software, PhotoDirector 5 gives you more time to perfect your photos and less time waiting for them to process. Introduce photo editing into your video editing workflow with support for full round-trip editing with award-winning video editor, PowerDirector. Smooth interoperability means you can send adjusted photos to PowerDirector with a single click so they can be integrated into video productions. PhotoDirector lets you export photos, make high quality prints and directly upload your work to social networks. Print module is packed with printing options and presets to suit your desired format. It comes complete with a wide range of page size settings and also allows you to adjust the printing resolution. Export to different color spaces including sRGB, Adobe RGB and ProPhoto RGB. Customize your exports with output resolution, file size, file destination, metadata and more. When running PhotoDirector 5 on a 64-bit Windows or Mac system, you can create 2K (2048 x 1152) or 4K (4096 x 2304) UltraHD video slideshows. Produce slideshows with transitions, motion effects, titles and background music. Choose from H.264 (M2TS and MPEG4) and WMV files and upload to YouTube directly. Share your favorite photos with friends and family by uploading them directly from PhotoDirector to Facebook or export them directly to Flickr. 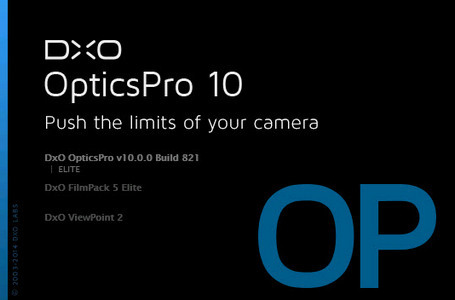 - Improves compatibility with some cameras. - Fixes the missing effects encountered when saving an album as a new project. - Fixes incorrect watermark position issue. - Fixes issues with signing-in to DirectorZone when a password includes symbols. - Fixes a hanging error when importing some .MP4 and H.264 AVCHD files. - Resolves crashes for IE 11 users signing into DirectorZone or YouTube. - Resolves missing video preview when using “Split View Mode” in Trim or Scene Detection. Go where traditional painting can't! This exciting new tool allows you to create beautiful kaleidoscope effects on canvas. Use your choice of media to paint electrifying patterns and colors, and see amazing results when you add a blending tool to the mix. The new user interface in Painter Essentials was inspired by the professional tools found in Painter 2015, but was built for beginners. Easily choose to get started with Drawing and Painting or Photo Painting. You'll find all the tools you need to create incredible photo effects and original art. With Real-Time Stylus & Windows Tablet PC plus Intel's 2 in 1 tablet device support, you can paint on the go and find new inspiration anytime, anywhere. Your Tablet PC will automatically detect when you are in Tablet mode and change the interface for you. In addition to its principal default DxO Preset, the software comes with with more than a dozen easy-to-use DxO Preset variants that can be applied to different kinds of images shot under all kinds of photographic conditions - high ISO, vivid color, softened contours, recovery of burnt highlights, recovery of detail in shadows, correction for anamorphosis. See the full list of DxO Presets. · Video conversion software MediaShow Espresso leverages all your CPU's processing muscle to transcode videos simultaneously, instead of by piecemeal. Support for multi-threading allows MediaShow Espresso to utilize up to 4 processing cores at once. · The sleek design of MediaShow Espresso's interface lets you quickly browse selected files before you start your video conversion projects. It's like liquid in motion. · MediaShow Espresso's convenient auto shutdown feature lets you save power by turning your PC off after video conversion is complete. 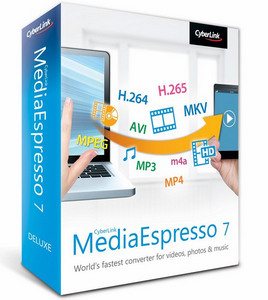 · Convenient video conversion software MediaShow Espresso lets you output videos for your favorite media playerPlay your video files on any device. MediaShow Espresso will convert all your videos for playback on any media player hassle-free. By supporting a variety of input and output video formats, you'll always be able to enjoy your favorite videos on the road or on a vacation. Share with friends and family who will enjoy watching your favorite videos on their media players too. · Fast video converter MediaShow Espresso offers blazing performance in outputting videos for your iPod or iPhone. With support for CPU and GPU optimization, converting files for your Apple products can be up to 10x faster. You'll wonder why you ever used any other method! · It's a breeze to broadcast yourself on YouTube. MediaShow Espresso allows you to convert and upload your videos to YouTube directly. Just check the option and follow the easy steps to transfer to your account. What's new in Action! 1.20.0? NEW FEATURE: Remote Action! 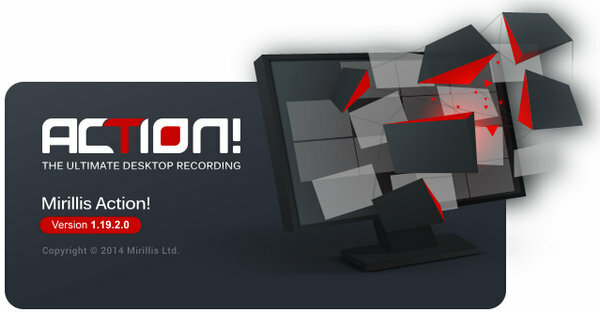 function added for remote PC access and playing PC games with Android devices! NEW FEATURE: Support for NVIDIA NVENC acceleration added. Available for real-time MP4 recordings, for exporting AVI to MP4, for LIVE Streaming and Remote Action! 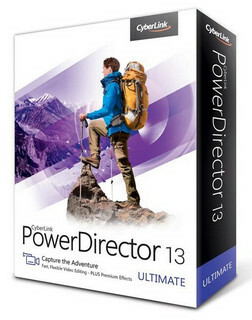 PowerDirector 13 includes all the powerful video editing tools for high quality video productions - 100-track timeline, MultiCam Editing, the world's fastest 64-bit TrueVelocity engine and much more. To bring more professional touch to your video creation, PowerDirector 13 Ultimate also includes worth over $650 value premium effects and templates to further enrich your video creation. Unleash your creativity with PowerDirector 13's customizable design tools - create your personalized transition, titles and disc menu, and edit up to 100 multicam clips with the most powerful video editing software! Need more effects and templates? PowerDirector includes over 50 new effects and templates to polish your video creations. When your creation is done, you can backup your projects using CyberLink Cloud service, or create movie discs with our new Menu Designer! The new MultiCam Audio Sync feature allows you to synchronize up to 100 timeline tracks by audio. Which means you can easily create MultiCam collages by freely transform video tracks as a PiP (picture in picture) object. The new Transition Designer provides an easy way to customize transition effects from an image. Simple import a image, PowerDirector will create the transition effect basing on the image you choose. You can apply over 120 built-in video effects to your titles, such as water reflection, tilt-shift or particle effects, to make your animated title creations look more unique. PowerDirector 13's menu designer greatly enhanced the usability - automatically align disc menu items when designing customized disc menu, you can also choose to display video thumbnails, or use a cleaner text menu without thumbnails. The enhanced stabilization engine smartly detects multi-axis and rotational shakiness, and remove the shakiness in sports videos. CyberLink Cloud is designed to work perfectly with PowerDirector to safely store your media creations and other files via the latest in cloud technology. PowerDirector's easy-to-use media library interface smartly put your source media, effects and tools in place. You can freely adjust the workspace to optimize productivity or search media library with keywords. Designed to utilize substantially less bandwidth. H.265 provides same compression quality with 32% size of H.264 videos. XAVC-S is the new standard of 4K and HD videos, widely used in latest Sony camera and camcorders. PowerDirector 13 comes with over 500 effects and templates, including over 50 brand new animated PiP objects, animated themes, titles and much more! Edit video anywhere with PowerDirector Mobile your Android and Windows 8 tablets with intuitive timeline interface. Drag-and-drop videos and photos, overlay transition and title effects, just like editing on your PC! When producing DVD or Blu-ray Discs, you choose to save the disc creation to ISO image format, which is easier to archive and retrieve your disc creations. - Supports hardware encoding with NVIDIA Kepler or newer graphics cards. - Improves audio format compatibility for audio sync function. - Improves video quality when burning Blu-ray Disc with the 1920x1080 50p profile. - Fixes the crash issue encountered when entering the Particle room with certain NVIDIA graphics cards. - Fixes the crash issue encountered when adding clips to timeline, with Intel graphics hardware decoding enabled. - Fixes the issue where program hangs when certain .mp4 clips are imported. - Fixes the black preview issue with certain .mov clips. - Fixes the issue that the “Stabilizer" setting is disabled after reopening a project. - Fixes the issue that the Blu-ray Disc root menu highlight option is out of position in some menus. - Fixes the issue where image sizes are reduced in the PiP Designer after typing a new opacity value.